American television is full of infomercials. Early risers and night owls are most often subjected to these gems, but all of us will see more than we care to in our lifetimes. Some of these infomercials stick with us. Those are usually the ones with those catchy tunes or hilarious one-liners that we find ourselves singing in the shower or doing impressions of in bars. None of us imagine that we will buy these items, but once in a while we get suckered in and we find ourselves forking over credit card numbers. Most of the time this ends up being a huge mistake, but sometimes we get lucky and we find something we simply could not live without. The first infomercial product I own is a little embarrassing to admit to. The advertisements for this product are so notorious that I can almost guarantee you will have the jiggle for it stuck in your head when you finish reading this post. Yes, I must admit, I am the proud owner of a clapper. I have to tell you this thing is awesome. A few years ago I bought my husband this really awesome lamp made out of deer sheds. (Those are the antlers that bucks shed every winter.) For years, this lamp sat unused in the corner because my husband and I were both too lazy to get up and turn it on and off, but now thanks to the clapper, the lamp is finally getting used. I simply clap my hands from anywhere in the room and the light will turn on and off. Of course my husband still hasn’t figured out how to do it, but I am sure he will catch on at some point. Another popular subject for infomercials is exercise equipment. These infomercials can be hard not get suckered into, after all, who among us doesn’t want that hot bod we see on TV. I was no exception; I purchased the Bender Ball in the early morning hours in the summer of 2007. The whole time, I was telling myself how stupid I was, but as it turned out I was presently surprised. The Bender Ball is a small exercise ball that will reportedly give you rock hard abs. While I can’t speak to that, I will say that this little ball does make sit-ups and crunches easier to execute while still giving me a great ab workout. The products in infomercials are notoriously cheesy, and it is a little embarrassed to admit to owning a few of these items, but I must admit that they are very helpful in living my unlimited life. Next time you find yourself awake at 3 in the morning, forgo the netflix and check out an infomercial, you might discover something really great. Because I am intrinsically lacking the “I love to work-out and sweat” gene, I am constantly searching for new options to keep me motivated. Time constraints, my lack of motivation as well as my limb loss combine to make working-out a chore. I find that I am more apt, and hence more successful, when I am able to merge my working out with my daily activities. Being the Mom to a little boy, my house is filled with game consoles and games. My husband and son can spend hours playing games and, although I am not a gamer, I have learned to appreciate their value. Not only do the games afford me a few moments of solitude, I discovered that I now have access to a wide library of work-out routines. A number of games incorporate enough movement to work up a sweat and to burn calories. After all, fitness doesn’t have to happen in a gym. Active is an interactive program designed to move the player through a variety of work-outs. This basic fitness program has options to work sections of the body, or to run you through a whole body workout. Because of the ability to personalize, the player can eliminate the exercises which are difficult or painful. I find that I have to adjust many of the exercises to accommodate for my prosthesis, but it typically doesn’t seem to interfere with the work-out. Dance Dance Revolution has received a lot of press in the past months. Despite it’s popularity, many lower extremity amputees find it frustrating with the constant impact on the residual limb becoming painful. This is a game that utilizes primarily foot movement in quick succession. Dancing ability, which I am admittedly lacking, is a requisite for this game. Although it looks fun, I had a difficult time with the pace, the impact and the pistoning within my socket as I tried to mimic the moves. Just Dance, another physical game, only utilizes the hand controller. Foot options are demonstrated on the screen but are not required to score points. Lower extremity amputees are not at a disadvantage! Be careful, this game will have you working up a sweat in a song or two. On days when I can’t walk outside, I have started turning to my XBox and Wii for an effective and fun fitness experience. In my last blog entry I talked about keeping the body moving and now I concentrate on the mind. It is a proven fact that daily stimulation of the mind is essential in maintaining a productive and active thought process. 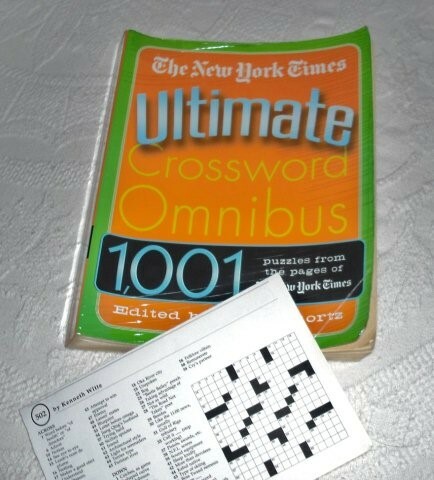 Of course there are many ways that this can be done but my favorite is with the old faithful … the NY Times Crossword puzzle. This doesn’t mean that I have to subscribe to the paper or join a costly club. My well-worn paper-backed book, pictured here, is what works for me. I bought it about two years ago and it’s still one of the best bargains that I’ve ever found. When I saw that there were 1001 puzzles featured I did the math and found, to my delight, that this put the cost per puzzle at just a little over a penny! That was enough to convince this tight fisted New Englander to buy it and I still, at this date, have many puzzles left to solve. As you see here there are 4 puzzles to each 8 ½ x 11 inch page. And this proves to be another benefit of the book. 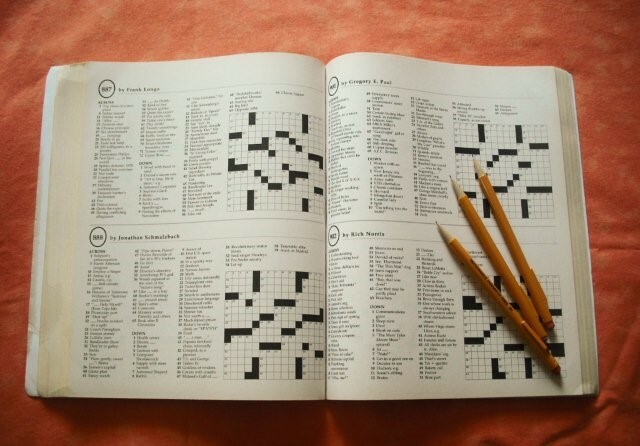 The paper they are printed on is a sturdy, matte finish and I can easily tear out a page or two, fold them and carry them in my purse, along with a supply of those yellow Papermate pencils that serious puzzle workers couldn’t live without! Now I always have a puzzle on hand when caught in a waiting room with nothing to read. I grant that there are many words in these puzzles that we will never use in casual conversation but that’s no excuse for letting our minds go stagnate. As I’ve said it’s my favorite exercise to ward off old-age brain-freeze but I’m sure you have some of your own and I’d love to hear about them. 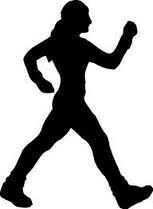 KEEP THAT BODY MOVING !! As you know, if you follow the UNlimiters blog segment, I am one of the 5 bloggers. The other four are much younger and they have medical problems that make my “old age” aches and conditions seem very insignificant in comparison. Just plain walking is an example of one thing that we seniors CAN do and often don’t. That must seem criminal to those confined to wheelchairs. I’ve watched a few of my friends practically give up on walking. These were all people in their 70’s and it wasn’t long before their sedentary lifestyle took its toll. Not only did they lose body strength, but depression also set in and it wasn’t long before “real” medical problems took hold. I was determined that this wouldn’t happen to me…but I needed motivation. I was in a non-walking rut. I had retired and found myself spending long hours in front of computer or sitting in my favorite chair with a good book. I knew that it was critical to keep moving but knowing and doing something about it seemed to be worlds apart. one of those little devices that count the number of steps that you take…and she’d set herself a goal of 10,000 steps a day, the equivalent of about five miles. 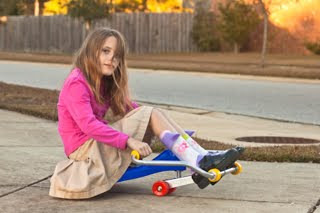 With a twinkle in her eye, she said, “I’ll bet you can’t do that” and that’s all it took! I bought my pedometer and found that I was already walking about size thousand steps a day. The extra four thousand was my goal and, to be honest, I haven’t reached it yet. 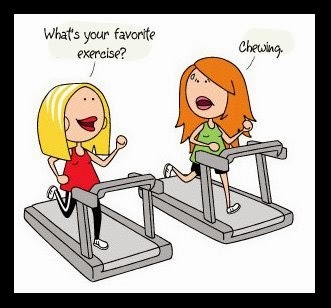 But I’ve changed a lot of things… driving when possible, and just plain getting out of the couch potato routine! I even brisk walk through my little house when the weather keeps me from going outside. The goal that I set was (and is) the challenge that I needed to make this work. So, even if I never reach it, I know that trying is half the battle. Try it for yourself. It’s a lifesaver. I just learned that obesity has been officially classified as a “disease” by the American Medical Association. While our increasing waistlines have long been referred to as reaching epidemic proportions (no pun intended), the categorization of obesity as a disease is supposed to both raise awareness and funding. Research indicates that as much as 80% of the disabled population is overweight or obese. This number is staggering; it is not surprising. Pharmaceutical interventions for weight loss yield inconsistent results and are laden with side effects. Weight loss surgery is expensive and risky. Despite the myriad of advances in the field of medicine, the only reliable and consistent treatment for this newly classified disease remains the staple approach: diet and exercise. When the remedy involves physical movement and exertion, individuals with disabilities are at a distinct disadvantage. Strengthening muscles and maintaining a healthy weight is perhaps more important for those with physical limitations. We are reliant upon various devices, whether they be a wheelchair, braces and crutches or a prosthesis, and their use creates unnatural stress on our body. Staying physically strong helps to minimize the strains that our body experiences on a daily basis. Thankfully Unlimiters is about overcoming the perceived “disadvantages” of life! Exercising when you have a physical disability may require more creative thinking, but it is certainly not impossible. Concentrating on what you enjoy rather than focusing on what is limited is a great place to start. I love going for long walks through the neighborhood, which is admittedly an ironic choice of activity since I am a leg amputee. However, I have come to relish the escape and quiet time that walking affords me. Between family and work obligations, walking by myself feels more like a luxury than exercise. My motivation to walk, which has become my primary source of exercise, is intrinsic because of the enjoyment that it yields. Of course, walking isn’t just for relaxation, I use this opportunity to work on my fitness. If you look through my kitchen junk drawer, you will find a variety of inadequate and broken pedometers. My altered gait and inconsistent speed apparently throw off the accuracy of most pedometers on the market. After years of searching I have finally found a pedometer that accurately measures my steps. I absolutely love my Fitbit! This tiny little device packs a powerful punch with its features and ease of use. Now when I walk I am able to measure not only my distance in steps, but also my calorie expenditures. Now all of my fitness information is just a tap away! I have been using the Fitbit for several months, and I have been impressed. My altered gait and limping does not impact this device. I even went for a small walk without my leg, just utilizing crutches, and the Fitbit continued to maintain its accuracy. This is the only pedometer that I have ever used that is not thrown off by gait deviations, significant limping or assistive devices. 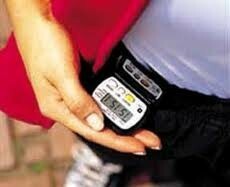 The fact that this pedometer even measures steps achieved with full crutch use is remarkable! About 10 years ago I decided to try Tai Chi and I attended a few classes. I found that I didn’t have the temperament for it but I was impressed with the warm-up exercises. These are 18 moves designed to relax and tone all the major joints in the body and since I have a pretty severe case of scoliosis (curvature of the spine) it seemed to be the perfect exercise for me. An orthopedic doctor friend assured me that she actually recommended them for her recovering patients so that clinched the deal. During the last 8 years I have had a fractured hip, non-malignant brain surgery and two sicknesses requiring hospital-ization but I’ve always returned to my exercises as soon as I could. 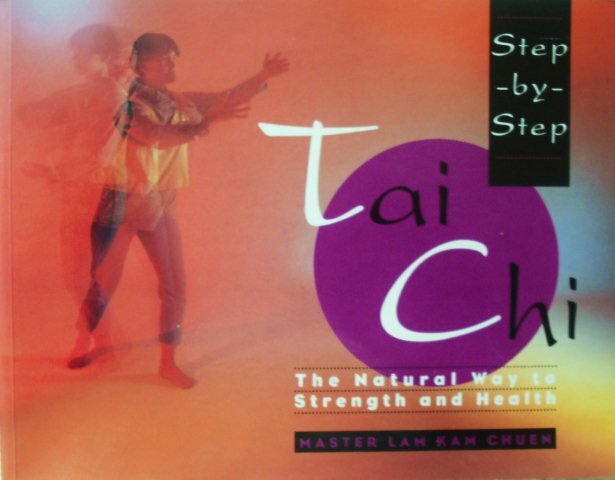 Actually this all started when I bought the book “Step by Step Tai Chi” by Master Lam Kam Chuen published by Simon & Schuster, Inc.
As it says in the title it takes the reader step by step through the entire Tai Chi regimen; but, it was the warm up exercises that captured my attention. They are described in simple, but very detailed, terms and with illustrations such as the one at the top of this blog entry that make it easy to learn. 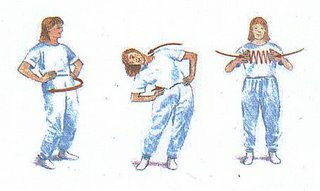 I have a good friend who enjoys kidding me about the fact that I don’t do the exercises s-l-o-w-l-y as the Tai Chi master teaches. I have to agree and my apologies go out to him, but I know myself well enough by now to know that anything more than 10 minutes in the morning and I wouldn’t stick to it. I can’t imagine starting my day without it now and, on the rare occasions that I have missed, I can tell it by early afternoon. My back starts to ache and I don’t have my usual energy level…and all because I didn’t devote those few 10 minutes to doing what’s good for me! No matter what your age, if you are like me … and have found an exercise regimen to be near impossible … I suggest you try these 18 simple moves. They’ve been a life saver for me and if I can do it you can too! GOOD LUCK!